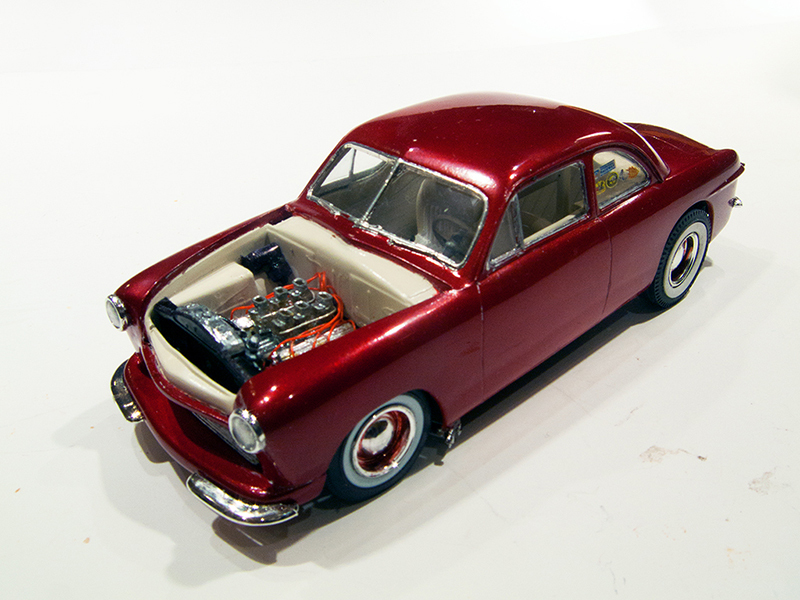 This is another project I’m preparing as an entry in this year’s 2018 TRaK Autorama ( see http://trakinscale.proboards.com/thread/18269/rules-guidelines ). With several hundred dollars’ worth of actual prizes on offer and 4 different categories (Rod, Custom, Street, and Racer) I thought I’d spread my luck and go for all four. The Rod entry is completed, the Racer entry nearly so and this one is my Street entry. While I’m pretty sure this one will be done in time for the December 31st deadline, it remains to be seen whether I can make the Custom entry happen. 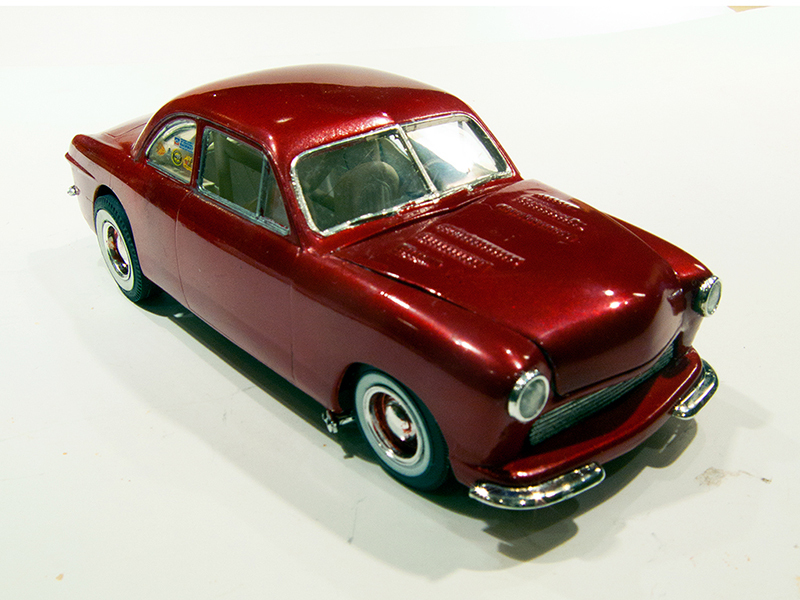 I’ve always admired the ’49 Ford Shoebox for its purity of design. 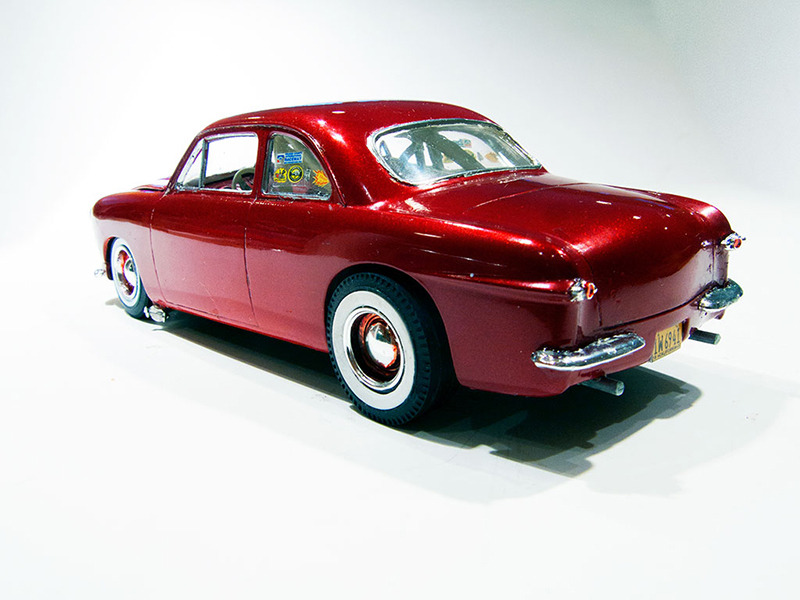 It was truly revolutionary in its day, banishing any vestigial trace of separate fenders once and for all. I also like its compact and balanced proportions. 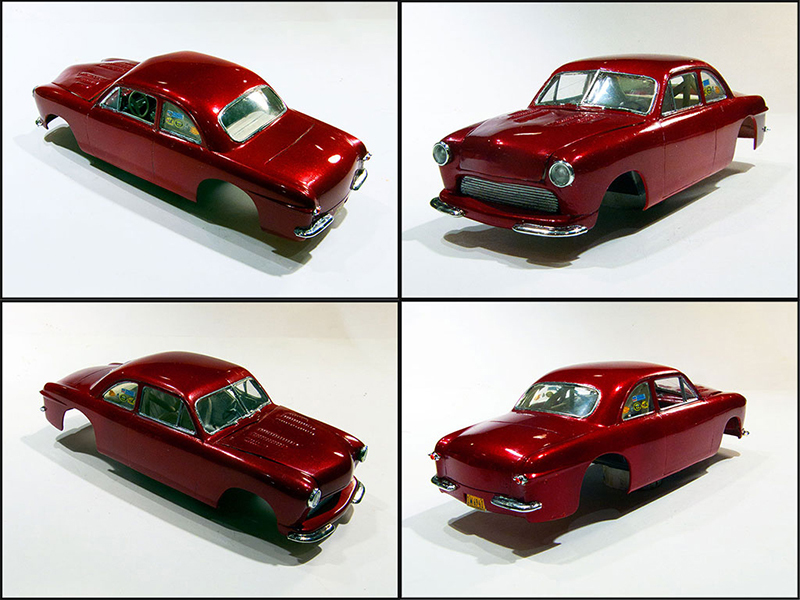 It doesn’t hurt that the basic AMT ’49 Ford Coupe kit is one of AMT’s greats and a delight to work with, everything fitting well and with lots of 3-in-1 customizing and hop up parts to work with. This project is designed to exploit all these attributes. Starting with the bodywork, my first task was to completely shave any trim from the body including side trim and door handles. Fortunately AMT did some of that work for me since the nose and deck are already trim-free. Then came the signature detail, molding a set of Revell ’32 Ford Roadster hood louvers into the top of the hood. There’s still a very slight amount of cleanup left to do, but after a ton of filling and sanding, filling and sanding, filling and…., etc., etc., it looks like I ‘ll be including this feature. But just in case it fails at the 11th hour the car will be styled to run sans hood, with a contrasting color engine bay and lots of chrome engine parts. This is an Autorama entry, after all!. But the spirit of the car is definitely as a drive-in cruiser and street racer, two of the most important functions of a Street Rod, IMHO. So the design features a radical early 60’s California rake, and big whitewall cheater slicks accommodated by the cut out rear wheel well openings. Other than the cheater slicks, these were all details included right from the original issue of this AMT classic. And, despite their less than utilitarian aspect, I’ve always admired the job AMT did with the molded grill surround and front and rear molded pans. 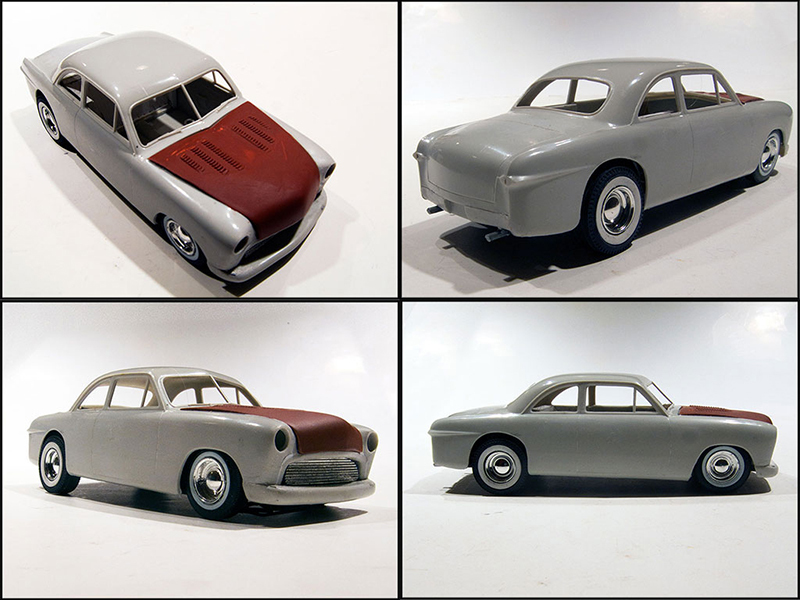 So these were included, along with a thin bar grill cut out from the custom grill included in the AMT ’51 Chevrolet Fleetline Coupe kits. With less than three weeks left to the deadline, I’m under the gun getting 3 TRaK Autorama builds completed. Two of them are already in progress, a Fiat Competition Coupe for the Racing Car class and this project for the Street Rod category. 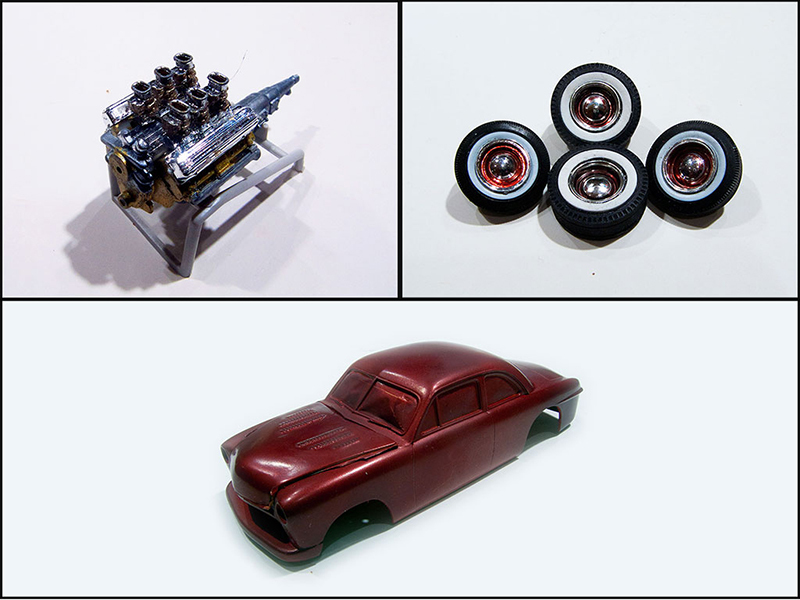 This past weekend I started the last of my 4 entries (my Revell AMT Box Art Deuce Roadster finished last month is #4), a 1957 Ford Thunderbird mild custom for the Custom Class. I’ll be posting more details on that one separately but right now here’s an update on my Shoebox street racer. The body is in paint now. 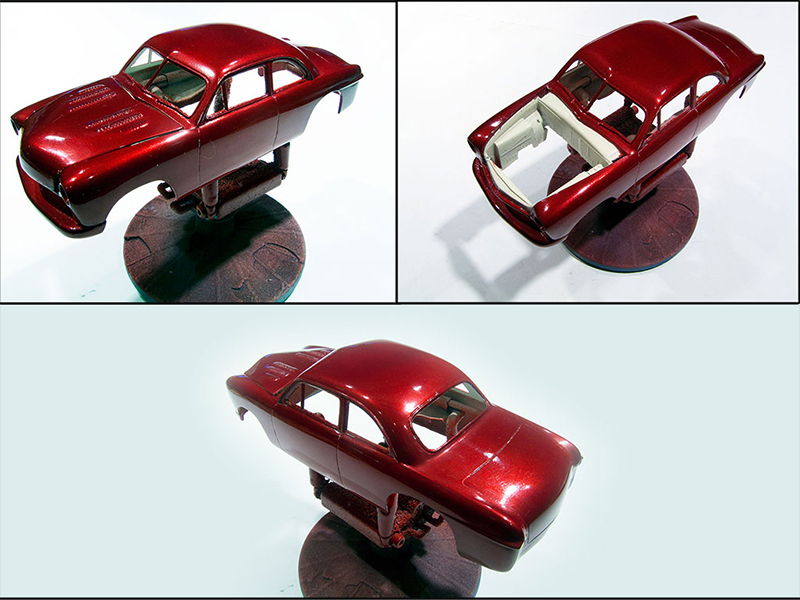 The color is three coats of Duplicolor Dark Toreador Red Metallic over a base of Duplicolor Wimbledon White lacquer. In the photo below you see it in raw color with just a quick buffing with a paper towel, enough to knock the surface irregularities off without getting down into the metallic particles. Since the picture was taken it’s gotten four coats of clear and is curing to harden for a final polishing. 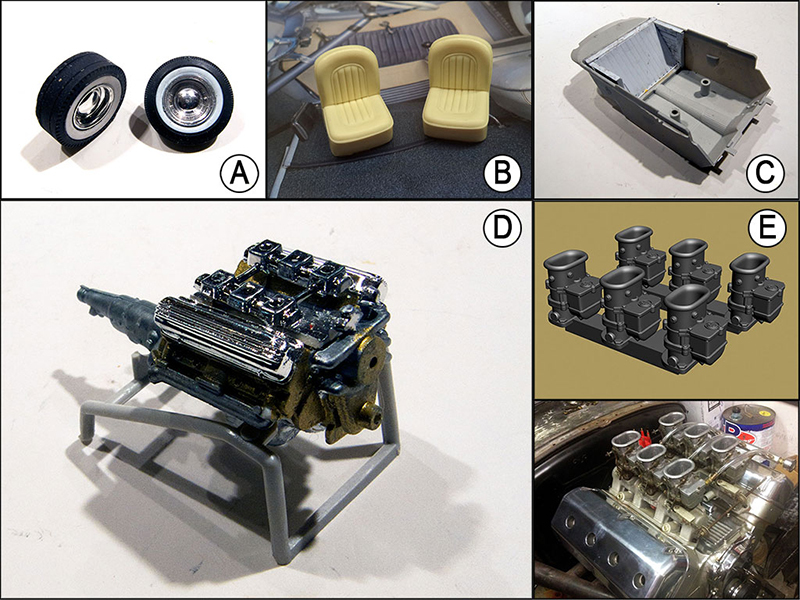 I received the 3D printed Stromberg 97s with the SP tops from Maple Leaf Modelworks and detailed them out in Tamiya Titan Gold on the carbs themselves and Molotow Chrome on the oval SP tops. They look real sharp, especially once they were glue into position on the chrome log manifold. Next up for the motor are ignition and plumbing and the fan drive after which it will be ready for installation. I’m hoping it will look show-ready sitting in the engine compartment which will be finished out in Wimbledon White lacquer to contrast with the body color. I’m planning on showing the car with and without the louvered hood. Now that the body color is on I also picked out the insides of the reversed rims with a 60’s style Kolor Krome to match. That’s it for now. The only really major work left besides finishing up the engine is the interior. Of the three remaining Autorama entries this is probably to closest to done and should make the deadline OK.
Just a quick update. On reason I like Duplicolor lacquers is they harden to a workable state quite quickly. After waiting 24 hours I was able to wet sand the paint with 1000 grit to get rid of any surface irregularities or orange peel. Then I shot 4 coats of clear. Another 24 hours and I was able to polish it out. I had thought about either scallops or speed part decals on the bodywork, but it came out so nice I’m going to leave it as-is and put speed part decals in the rear quarter windows instead. Right now I’m trying to stay focused on finishing the motor and interior, but I can’t wait to get some chrome on this thing. It should pop! Another “minor” update, but if these Autorama projects are going to get done it will be because of daily progress like this. 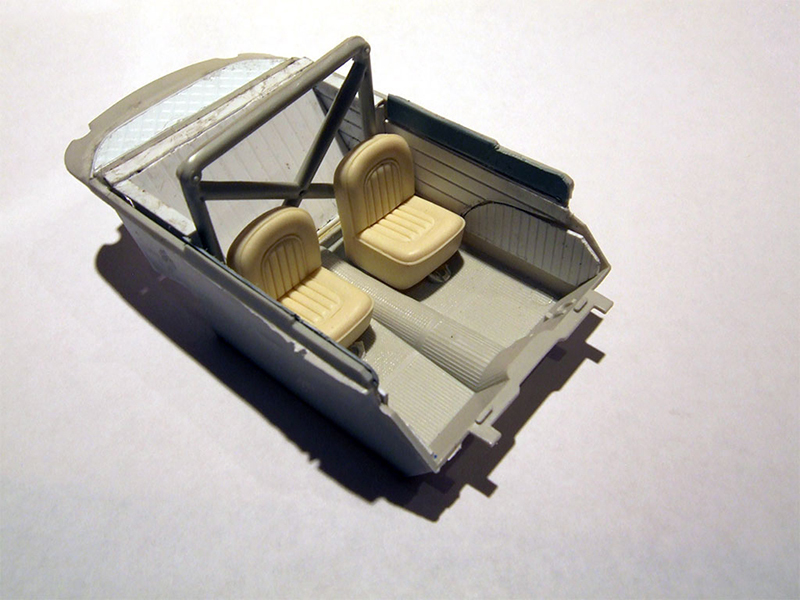 Today I got the tuck ‘n’ roll interior completed, built up from patterned styrene sheet of various sorts. 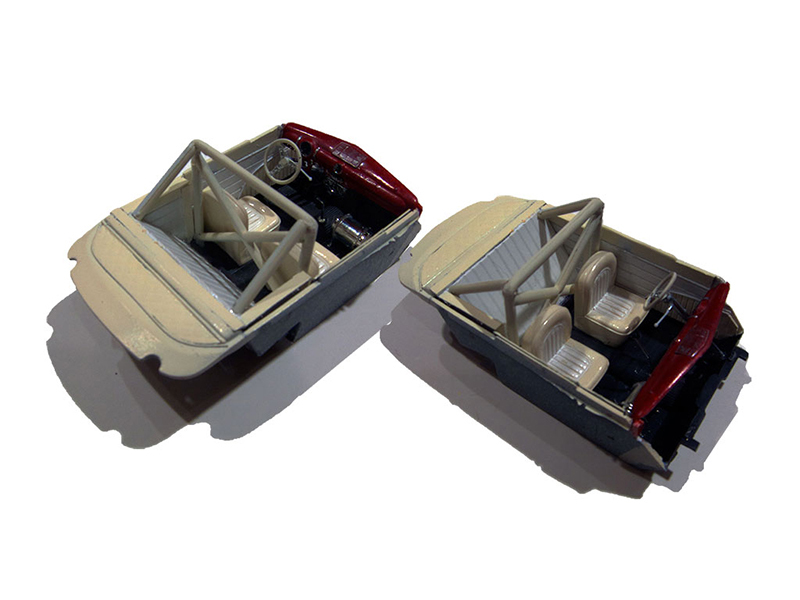 Here it is in bare plastic with the lovely bucket seats I got for this project from Ed Fluck at Drag City Casting. The primary color will be Wimbledon White with a flat black floor and red piping added after it’s all painted. The dashboard will be the stock item, painted in body color. The roll over bar will get additional bracing facing rearward diagonally into the rear panel where the seat used to be. 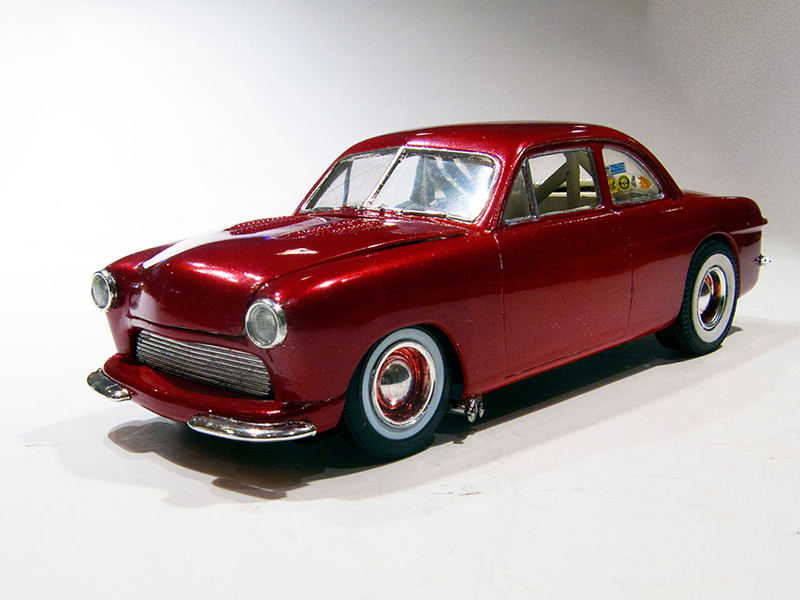 Of the 3 TRaK Autorama projects I’m trying to complete by the end of the year (the contest deadline) the ’49 Ford Street Rod project seems to be the one which is commanding most of my attention. At this point it’s very near completed with the interior and bodywork in final presentation form and only the final chassis and motor assemblies to complete, and even these are virtually done. 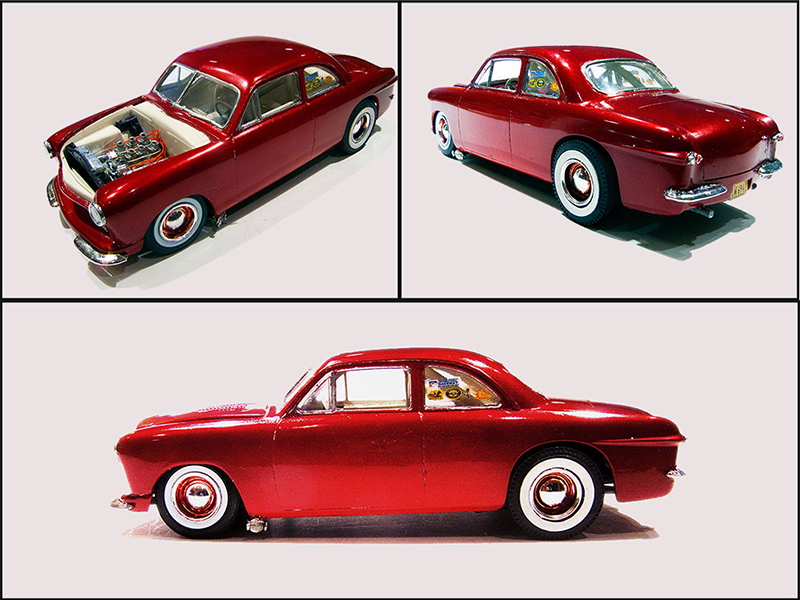 Below are final photos of the interior, which, as is the case with most scale models, has since disappeared into the body. 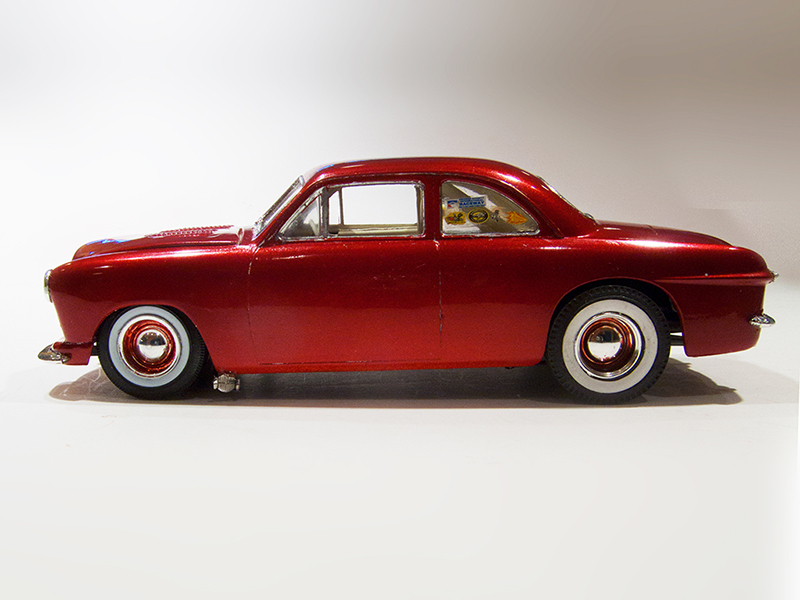 Also presented is the completed body and interior assembly, including lights and bumperettes. As I said, all that’s needed now is to complete the engine detailing and engine compartment, mount the wheels and do some final chassis detailing and then glue it all together. This one will make the deadline almost certainly. The other two projects, a Fiat Competition Coupe started last summer, and a ’57 T-Bird started barely more than a week ago will need all my attention in the 9 days remaining. At least it’s the holidays and there’s time available for modeling work. But…yikes! Looks awesome, Bernard! Fingers crossed! 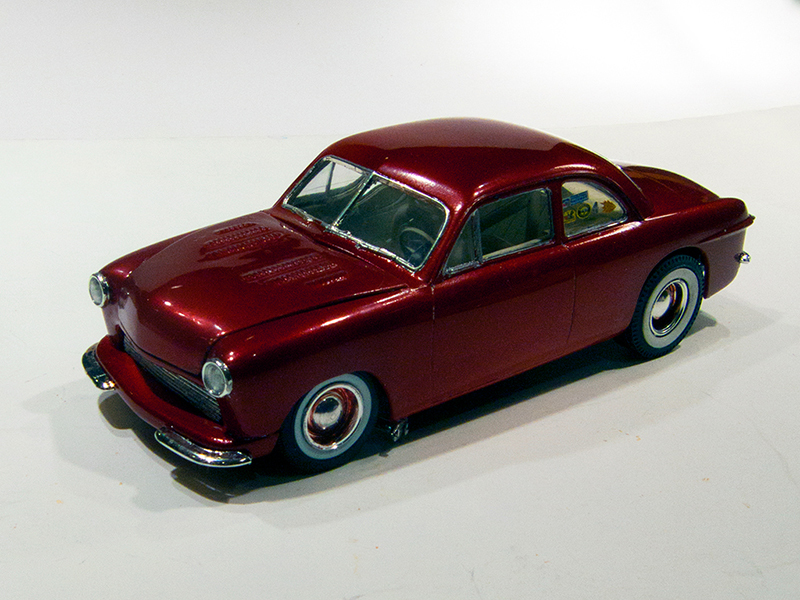 I got this Autorama entry completed without the usual end-of-build melodrama. The paint’s still shiny, nothing major failed to fit or fell off and disappeared, and all 4 wheels are firmly planted on the ground. Whew! And it came out much as I had imagined it in mind’s eye, a real California-style early 60’s triple threat, designed to garner attention at the drive-in, and competitive at the stoplight Grand Prix, and (hopefully) at the Autorama! Below is a teaser composite of the result. I’ll reserve a formal presentation until after the TRaK Autorama deadline on the 31st! In the meantime, Thanx! to all who followed along and Happy New Year! One of the finest 49 Fords I have ever seen! Thanks for sharing the project, she is a beaut! Thanks to you both, I'm glad you dig it! And thanks to all who followed along with my best wishes for a happy and fulfilling 2019. Here's are the final "beauty pics"
Looks to be right off the cover of "Custom Rodder" mini-magazine. I agree Chucky. This is very period correct. A great job within the genre Bernard was going for. It just looks "right". Great work Bernard. Came out great Bernard. Good luck in the contest! She's a beauty Bernard! Definitely a strong contender for the contest! I love the color and hood louvers! Much thanks to you all for the generous words. I'm glad you all like it!